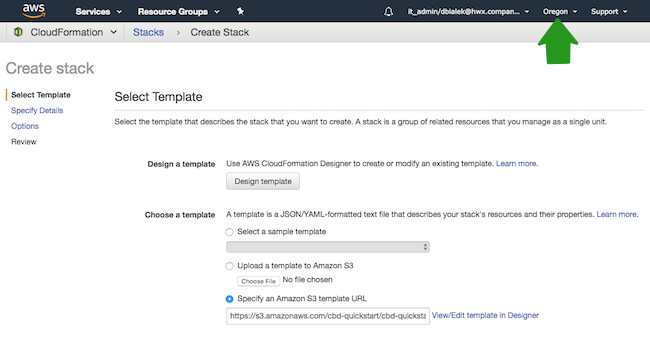 Launch Cloudbreak from a CloudFormation template by using the following steps. This is the quickstart deployment option. 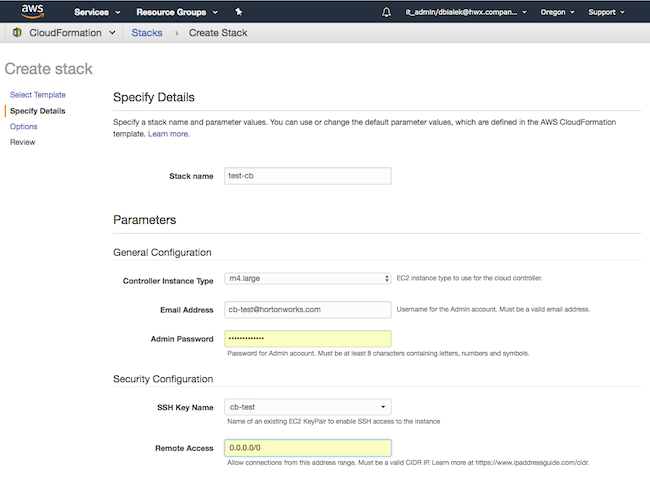 The quickstart option cannot be used with AWS GovCloud. You must use the production deployment option. If needed, you may change the region if needed by using the dropdown in the top right corner. Click Next to display the Specify Details page. Stack name Enter name for your stack. It must be unique in your AWS environment. Controller Instance Type EC2 instance type to use for the cloud controller. Email Address Username for the Admin login. Must be a valid email address. Admin Password Password for Admin login. Must be at least 8 characters containing letters, numbers, and symbols. SSH Key Name Name of an existing EC2 key pair to enable SSH to access the instances. Key pairs are region-specific, so only the key pairs that you created for a selected region will appear in the dropdown. 192.168.27.0/24 will allow access from 192.168.27.0 through 192.168.27.255. 192.168.27.10/32 will allow access from 192.168.27.10. 0.0.0.0/0 will allow access from all. Refer to Cloudbreak instance security groups for more information on the inbound ports that are used with Cloudbreak. Click Next to display the Options page. On he Options page, if you expand the Advanced section, there is an option to Rollback on failure. By default, this option is set to Yes, which means that if there are any event failures when creating the stack, all the AWS resources created so far are deleted (i.e. rolled back) to avoid unnecessary charges. If you set this option to No, if there are any event failures when creating the stack, the resources are left intact (i.e. not rolled back). Select the No option to aid in troubleshooting. Note that in this case you are responsible for deleting the stack later. Click Next to display the Review page. On the Review page, click the I acknowledge… checkbox. The Stack Name is shown in the table with a CREATE_IN_PROGRESS status. You can click on the Stack Name and see the specific events that are in progress. The create process takes about 10 minutes and once ready, you will see CREATE_COMPLETE.